A pioneer in bringing electricity to India, CESC is now once more among the country's most efficient utilities. The correspondent complains of having to pay for "full power, and apparently getting about half " of it. This is tantamount to shelling out "a first class price for a second class article", he adds. Such a letter appearing in a newspaper would be perfectly appropriate even today, in most parts of the country. But in fact it was written on April 23, 1903, and appeared in a Calcutta daily. The offender? The Calcutta Electricity Supply Corporation, now called simply CESC, then a listed London company owned by a host of shareholders, and now part of the Rs 17,000 crore ($3.77 billion) RPG conglomerate. The Indian Electric Co. was registered in London in January 1897 with a capital of 1,000 pound sterling, to provide power to Calcutta. 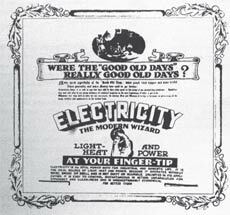 A month later, it changed its name to The Calcutta Electric Supply Corporation. When it began, its total capacity consisted of three boilers of 500 horse power each. Electricity proved an instant hit, transforming the lives of the city's residents. The Europeans could now enjoy ballroom dancing under electric fans; hand-pulled punkhas went out of fashion; tramcars unhitched themselves from horses; eight and 25 watt electric bulbs became hot selling items, as did - in subsequent years as they were invented - electric irons, refrigerators, lifts. From 6,000 consumers in 1912, the year the capital shifted to Delhi, CESC today has over 2.4 million of them in its licensed area of 567 sq km covering Kolkata and some adjoining areas. Its combined capacity is now 1,225 megawatts, or MW. Its activities have spread well beyond Kolkata, with one subsidiary setting up a 600 MW plant at the port town of Haldia in West Bengal, another working on a 2,000 MW project in Bhagalpur, Bihar, and a third building a 600 MW at Chandrapur, Maharashtra. Until as late as January 1970, CESC was controlled from London. In 1978, it became a rupee company. Chittajit Dasgupta, who joined the company as a trainee engineer in the mid-1950s and retired as Deputy Managing Director in 1999, is a bridge to the past - a past of oil fired boilers and direct current, or DC, transmission. Electric lines were then carried at 33 kilo volts, or KV. The network completed the switch to underground 132 KV cables 10 years before Dasgupta retired. "I was sent to Britain for training with British Electricity for the switchover," he recalls. 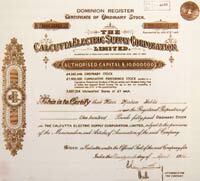 1897: London registered company, The Indian Electric Co., gets a licence for Calcutta through its agent, Kilburn & Co. A month later, the company changes its name to Calcutta Electric Supply Corporation. An advertisement of electric table fans, which were in huge demand. Rama Prasad Goenka, head of RPG Enterprises, whose forefathers had settled in Calcutta in 1820, acquired CESC in 1989. Sanjiv Goenka, his younger son and now Vice Chairman of CESC, recalls how the acquisition began in a most haphazard manner, with him buying a parcel of shares offered by one Chander Dhanuka, who had picked it up from the open market. "My father was totally opposed to it," he says. "I bought the shares without telling him. He did not eat for two days when I told him about it." CESC did indeed seem a terrible acquisition target then. The utility was everybody's favourite whipping boy because of the eight-hour-plus power cuts in the city. Supply was then just 300 MW, a quarter of it lost during transmission and distribution, while demand had long ago outstripped it. But the Goenkas believed things could be set right. They began putting up more power plants, including three units of 250 MW each at Budge Budge, 30 km from Kolkata. "We worked to a plan," says Sanjiv Goenka. "It has taken us a few years to get there, to become one of the most efficient utilities in India, but we have done it. From eight hours of power cuts a day, Kolkata now has virtually no power cuts." The plant load factor at CESC power stations, the share of the capacity actually used to the installed capacity, has gone up from 52 to more than 90 per cent. The debt equity ratio has come down from 5.4:1 to 0.7:1. Today, as Kolkata strives to catch up on the transport front as well, some of the early infrastructure created by the CESC is also likely to prove useful. Back in 1931, CESC engineers built a tunnel under the Hooghly riverbed to carry power lines across. With an east-west Metro rail link in the offing, Metro engineers are examining the tunnel, which is still operational, as an engineering model, as the last stretch of the Metro will also go under the Hooghly.